Rosh Hashannah is behind us and the year 5771 has begun. The air is a bit cooler here even in Memphis, which means that there are plenty of holiday shows to prepare for. But first I want to share photographs of the finished tallitot taken by my friend and professional photographer, Guillermo Umbria. The project, commissioned by a large synagogue, began a year ago in October 2009. First there were meetings with the rabbi, then a design committee was assembled and we discussed colors, designs, and various interpretations. For several months I wove small samples of possible designs and in December presented a formal presentation with photographs, sketches and woven samples and yarn samples. The project was approved, and in January 2010 I met again with the design committee, this time with samples of yarn and we held the skeins up to the walls, rugs, stained glass windows, furniture, and Torah covers (mantles) to find the best combination of colors. Once that was decided, the yarn was ordered and all arrived by February including some hand dyed yarn that was as close to a true match to the colors in the Sanctuary as possible. There was a problem, though! I had several Spring shows scheduled for March, April and May, so that the actual weaving process couldn’t begin straight away. I was able to prepare the warps and thread them on the looms by the end of April. And it was at that time that I slowly started weaving the prayer shawls. The weaving picked up during the summer months and the final pieces were delivered the last day in August. Which wasn’t bad, as I had promised them to be finished by the last week in August. Whew! That was close, but I made it. And it was a beautiful sight to see the three rabbis and the cantor wearing the tallitot over their white robes for the first of several services during these High Holiday Days, or 10 Days of Awe. Atarah, neck band for "Ner Tamid"
Atarah, neck band for "Sha'arei Torah"
As the song says, “And the Beat Goes On”, because I am once again back at my looms, swinging the beater forward, now weaving scarves and fabric for purses. This time to prepare for several holiday shows and classes over the next several months. I’ll post these as the dates get closer. Meanwhile, here’s a look at what will be in store as far as handweaving goes for the Memphis market during the holiday season. Until now, readers of this blog had only seen photographs of religious commissions I had designed and woven for Jewish worship. 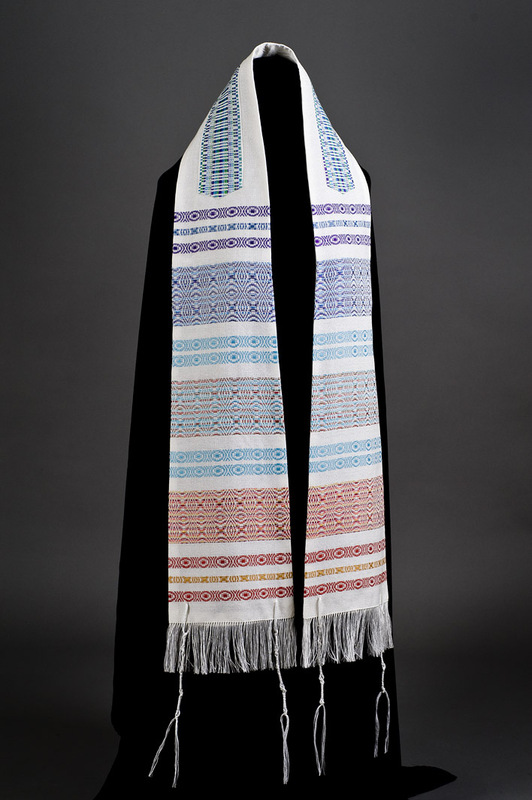 However, my first years of liturgical weaving began with commissions for the Christian community. Working with church representatives, I designed and wove paraments and vestments for use in their worship service throughout the religious seasons. Paraments refer to any fabric hangings which can be draped upon the altar, pulpit, lectern or credence table used in a church service. Most of the paraments that I wove were handwoven as a matching set of three so that one large piece was an altar cloth and two smaller pieces were used as a pulpit fall and a lectern bookmark. 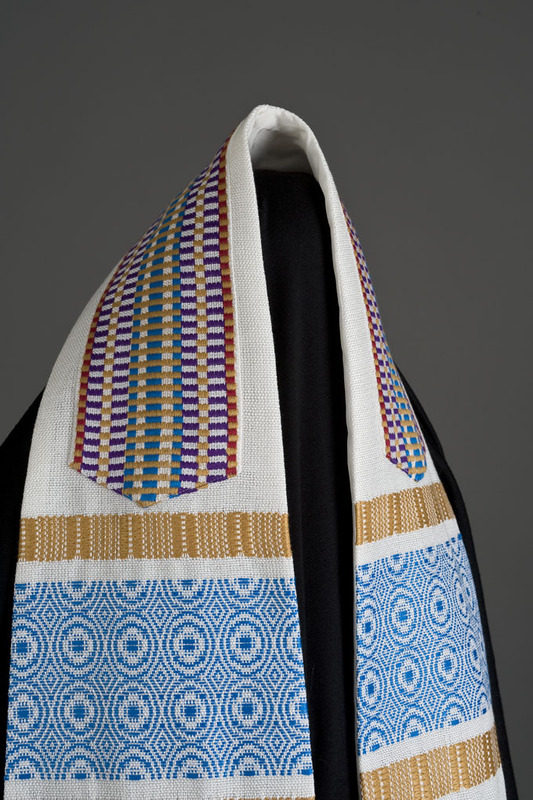 Liturgical stoles are narrow strips of material worn over the shoulders of the pastor leading the church service. In many ways these are similar to the narrow ceremonial tallitot or atarot that I recently finished weaving for the religious leaders of a Jewish congregation. The church year encompassed many seasons with each one represented by a different color which was the main criteria for the design elements. Below are some religious textiles that I had previously been commissioned to weave by churches and members of the Christian community mostly in the Memphis area. I apologize for the quality of these photographs. The green set of paraments for Ordinary Time is visible during the time between Epiphany and Lent. 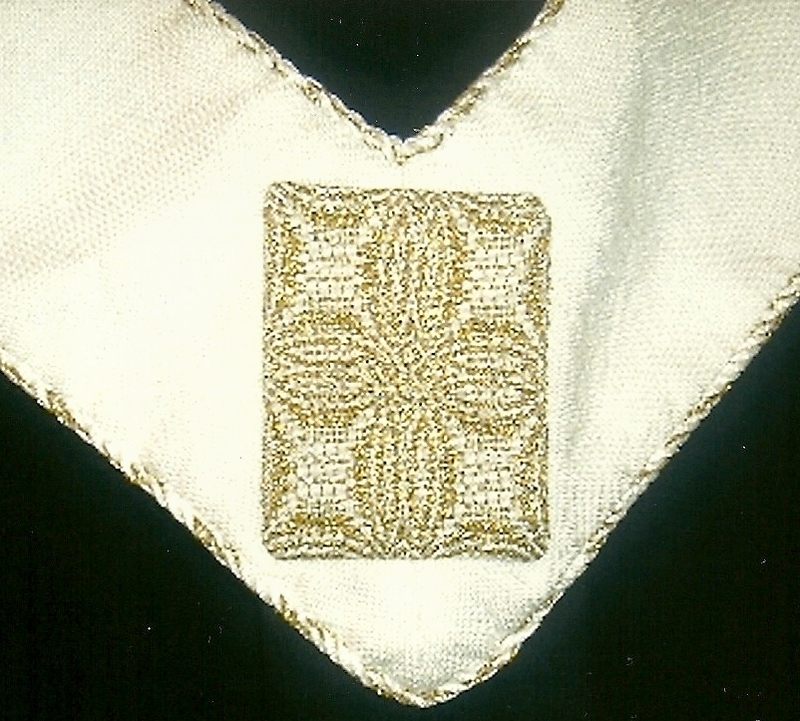 The altar cloth was woven in a rep weave pattern with alternating rows of a bundle of 5/2 perle cotton strands in one row and a single strand of sewing thread in the next row. 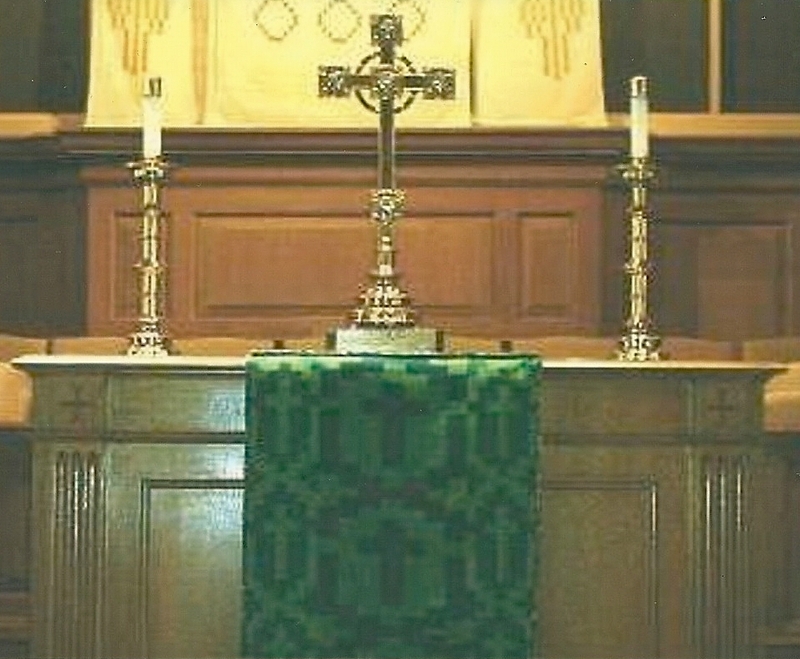 Two liturgical stoles were woven from the same pattern. 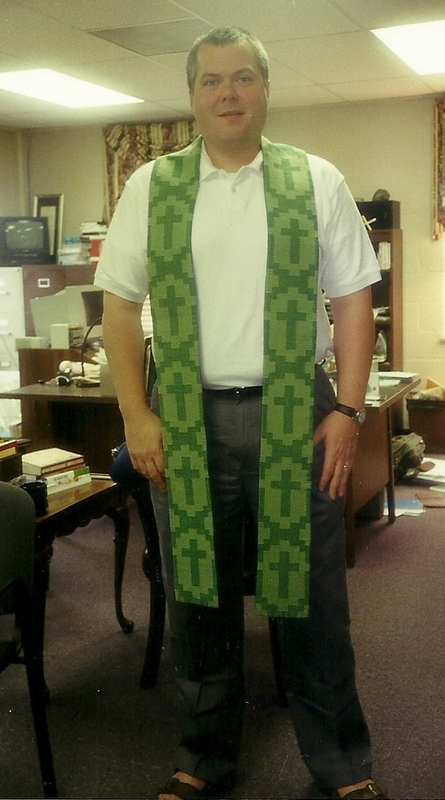 Each stole was a slightly different value of green as they were to be worn by the two pastors leading the service. Liturgical stole for Lent "Crown of Thorns"
This stole for Lent, the 40 days before Easter, was woven in an 8 harness undulating twill pattern with an overshot inlay of sewing thread in the decorative gold band. 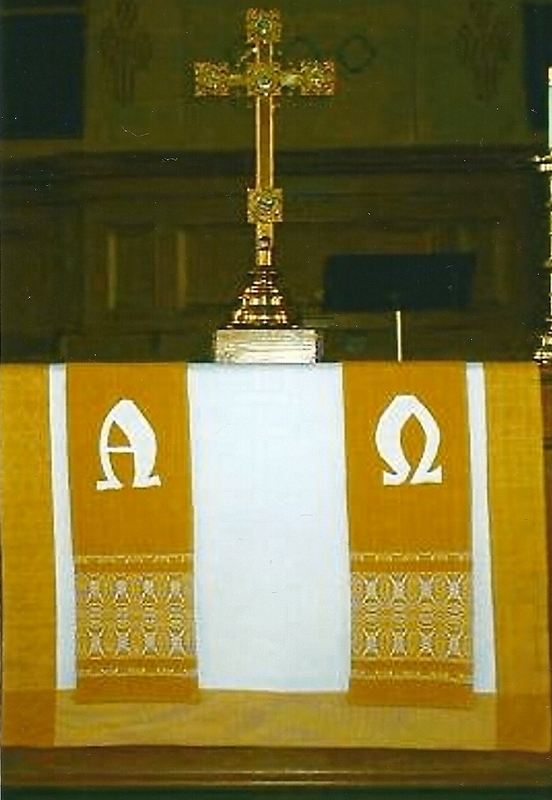 The set of paraments for Easter consisted of 5 separate textiles: the pulpit fall, lectern bookmark, altar cloth, and two separate and narrow pieces which were draped over the larger altar cloth. 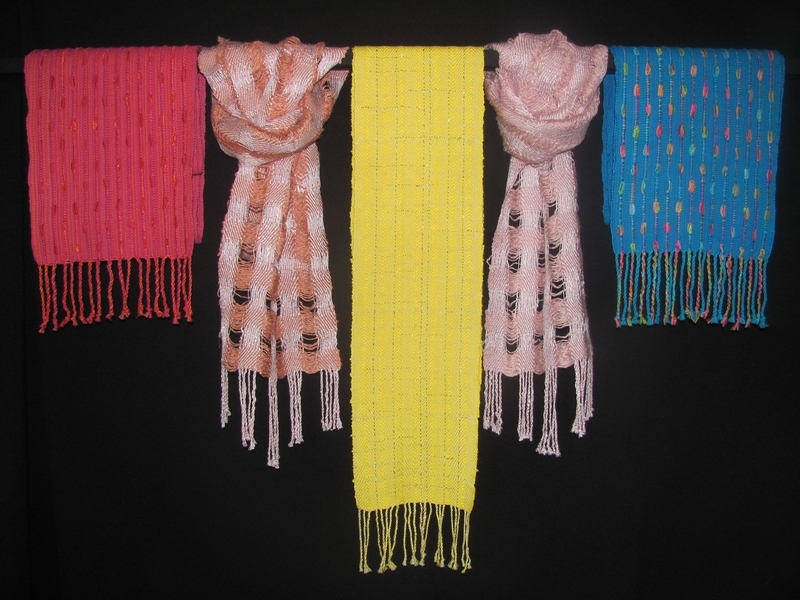 The pattern bands of the two narrow cloths were woven in the traditional overshot pattern known as Mary Ann Ostrander. The “Alpha” and “Omega” symbols were ultrasuede material cut and appliqued onto the handwoven fabric. 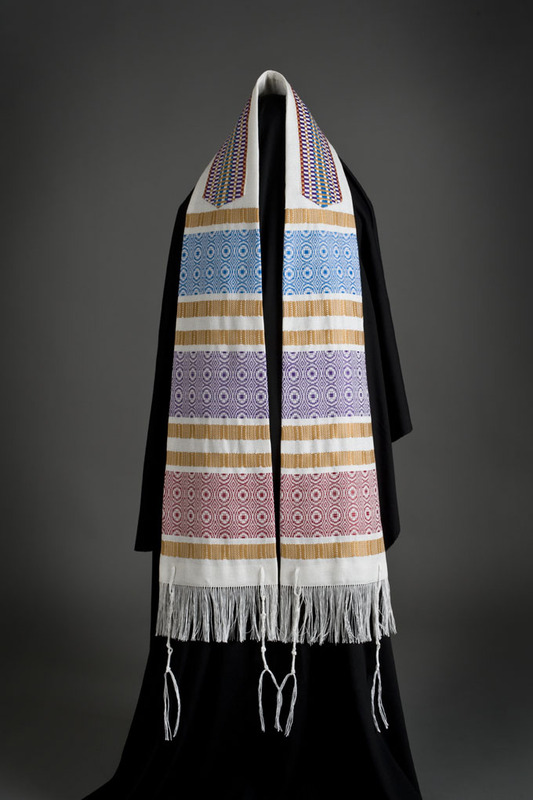 I had been commissioned to weave a ceremonial stole for use at special occasions in honor of a newly ordained Episcopal priest. The pattern on the front were several bands of a repeating Mary Ann Ostrander woven design. The wearer wanted a matching design on the back of the stole as well, since during services she often had her back to the congregation. Because there was a seam sewn at the back, I was unable to weave in the Mary Ann Ostrander pattern at this point in the fabric. Instead I made a “patch” from a woven sample and appliqued it over the seam. I also twisted a decorative cord incorporating the gold metallic yarns with perle cotton and sewed it all around the edges of the stole. The paraments for Pentecost, 50 days after Easter, were woven in an undulating twill. 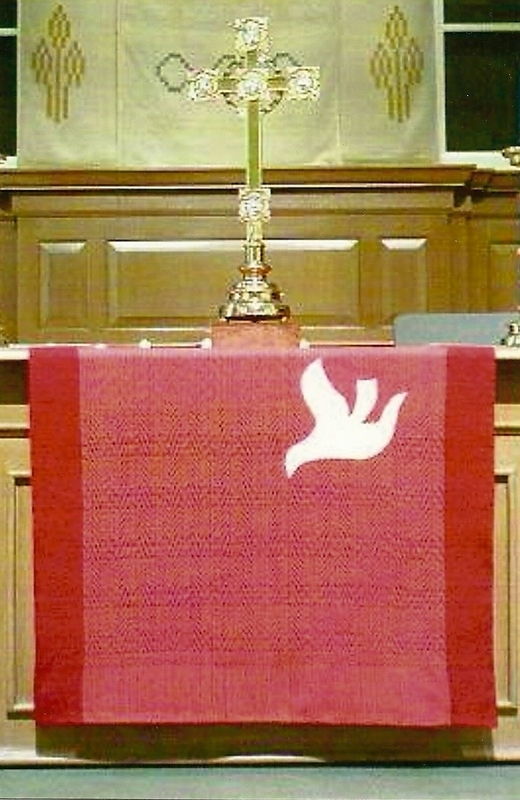 The Church representatives wanted an image of a dove to be included in the altar cloth. The shape of a dove was cut and appliqued onto the handwoven cloth. 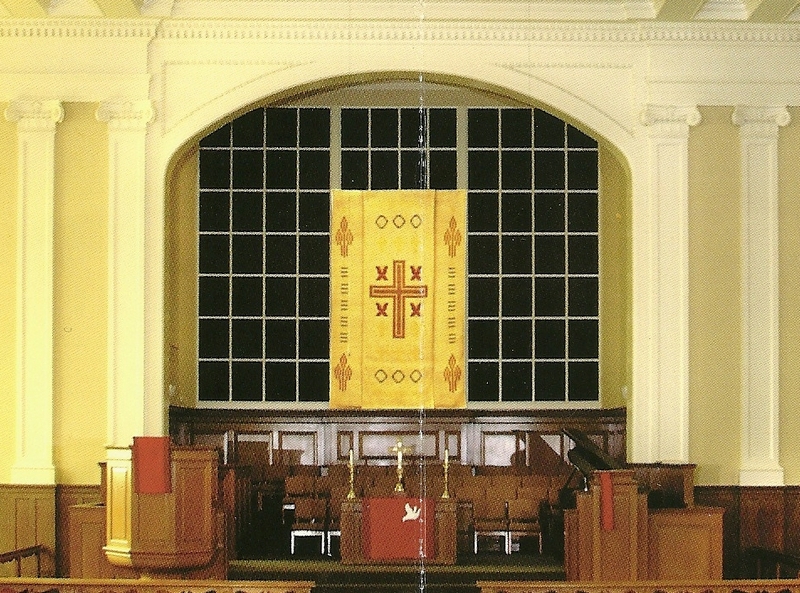 The photograph of the sanctuary includes all three textiles woven in this set. 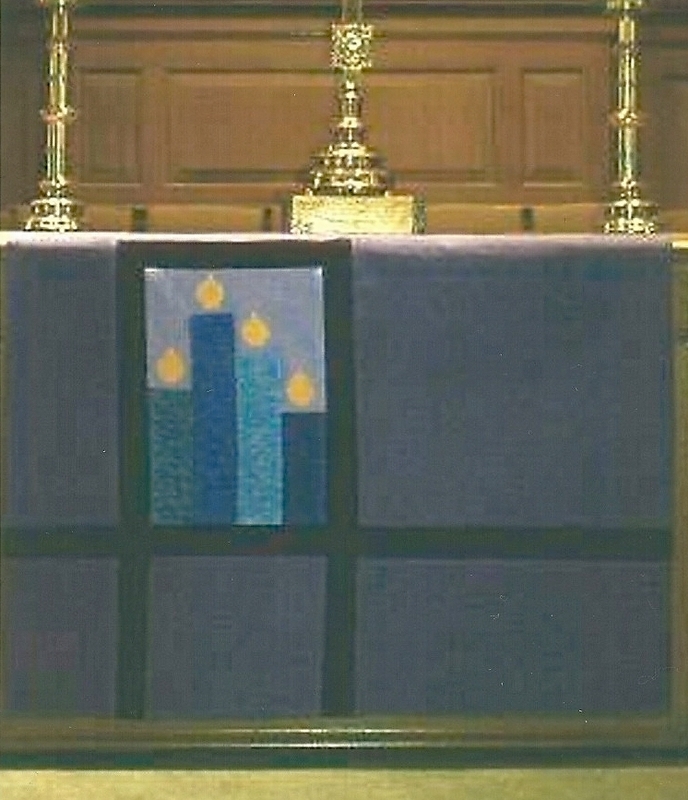 The large tapestry hanging above the altar had been woven by Margaret Windeknecht in the 1960’s. Mrs. Windeknecht who passed away a year ago had been known for her publications on color and weave effect, twill, and rosepath weaving patterns. For Advent, the four Sundays before Christmas, I was commissioned to create a set of paraments that included an image of the 4 candles representing this season. The altar cloth was woven in sections, then pieced together. the inset is done in Theo Moorman tapestry technique. All the religious textiles shown here are lined with dupioni silk fabric in a color matching the handwoven cloth. And so the evolution of my development as a liturgical weaver continues. 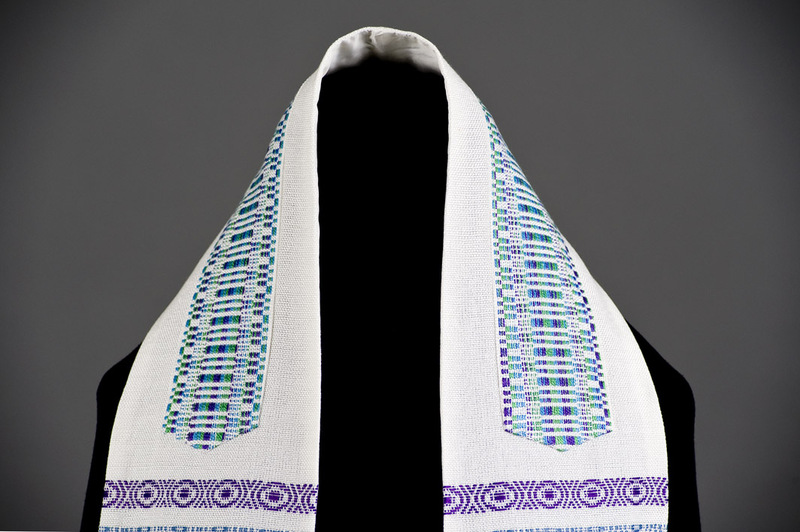 No matter which denomination commissions me to design and create a textile for religious worship, I always keep in mind that my work embraces the principle of hiddur mitzvah which literally means a commandment to make things beautiful while doing good. And this is a principle that all of us should keep in mind, whether we are weavers or not!